Welcome to Jubilee, Texas: where everyone knows everybody’s business—especially if that business is love! Ex-champion bull rider turned cutting horse cowboy Joe Daniels isn’t quite sure how he ended up sleeping in a horse trough wearing nothing but this Stetson and cowboy boots. But now he’s wide-awake and a citified woman is glaring down at him. His goal? Get rid of her ASAP. The obstacle? Fighting the attraction he feels towards the blond-haired filly with the big, vulnerable eyes. This is one of the books I got in my awesome goodie box from Avon. I have to admit, this isn't one I would have been likely to pick up otherwise. Despite encouragement from the blogosphere, I am merely neutral on cowboys. Meh, even. Mind you, I'm not opposed, exactly. It's just that they don't do anything for me as a archetype. Dukes, moguls and vampires are more my thing, I guess. Also, just everyday guys like Nora Roberts does so well. But country boys aren't really my kind of guys. The other thing that turned me off about this cover blurb was one single word. Can you guess what it is? "the blond-haired filly with the big, vulnerable eyes." Filly? ICK. So, this book wasn't on the top of my list, but I decided to give it a shot and I'm glad I did. I'll confess that Joe rubbed me the wrong way for awhile at the beginning, with a bit more of the swaggering good ol' boy than I love, and the bar fight scene that got the heroine all hot would have completely appalled me. But to be fair, Joe never applied the word "filly" to Mariah, so I'll chalk that up to the blurb writer. And this cowboy, with his swagger and belt buckle and bar-fighting black eye DOES appeal to the heroine, Mariah, and that's enough to make it a good romance in my book. There's great chemistry between the two; and character arcs for these two are very nicely done. I think the best part of this story is the way the couple truly gets to know each other over time. They start out with preconceived notions and assumptions that are gradually corrected without artificial-feeling major turn-arounds -- they are more like gentle, gradual course corrections. I don't see that done very often in the typical page count book these days. I also really liked the secondary romance between Ila and Cordy who had some really wrenching scenes. The bantery Moonlighting*-style dialog between the two has some great moments but occasionally drags on too long for my taste. I got the feeling the author was doing this intentionally for effect, so maybe it works for others. It's both a plus and minus in my book. Another thing that tweaked me was that it seemed like Joe was too frequently comparing Mariah to his deceased wife. I can handle guilt pangs after the fact, but he shouldn't be going down a checklist in the middle of a kiss, during the actual moment with Mariah. On the all-the-way plus side, Wilde spins out some world-class sexual tension in this story, holding out til almost the bitter end. For that, I will forgive her use of the term "love muscle" in the epilogue. 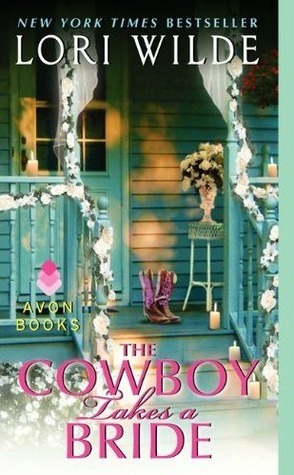 A cute city mouse/country mouse story with a hot cowboy and equal measures of "getting over the angst of the past." You had me with the comparison to Moonlighting. Man, I loved that show!